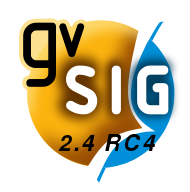 gvSIG 2.4 RC4, the fourth gvSIG 2.4 Release Candidate is now available to download from the gvSIG website. With the release of this new build we encourage you to test it and send us any errors and suggestions in the users mailing list. The main new features of this version have been published at the gvSIG blog during the last weeks. Some of them are the possibility to download data from Open Street Map or the access to H2 from gvSIG Desktop. This entry was posted in development, english, gvSIG Desktop, testing and tagged gvSIG 2.4, testing. Bookmark the permalink.